The first impression of Provincetown most visitors have is how striking the surroundings are. The town is situated at the tail-end of Cape Cod and hugs the harbor. We are surrounded by the Cape Cod National Seashore which offers all sorts of recreation activities. Provincetown has three main beach areas. The town itself runs along the Harbor Beach which is just one block away from Aerie House. This is a very active beach, good for swimming and sunning, and is active with boats, kayakers, wind surfers and those just strolling and taking in the sights. Both Herring Cove Beach and Race Point Beach are located in the National Seashore Park. Herring Cove Beach is about two miles out of town and faces Cape Cod Bay and is a great swimming beach due to its calm waters. This is the most popular beach and has food service and restrooms. There are separate areas for gay men, women, families and recreational vehicles and is THE place to go and watch a beautiful sunset over Cape Cod Bay. All in all quite a scene! Race Point Beach is about three miles from town and is spectacular open ocean beach. The water here is much rougher so it is not great for swimming so not normally very crowded but it is often on the list for the most beautiful beaches in America. Provincetown is surrounded by the Cape Cod National Seashore Park. Both Herring Cove Beach and Race Point Beach are located within the park. The park offers miles of paved trails for our guests to bike, hike or jog. The trails wind through forests with ponds, open dunes and beautiful beach areas. This is also a great area for bird watchers. Art’s Dune Tours provides fascinating four-wheel drive tours through the area and visits parts of the park inaccessible otherwise. 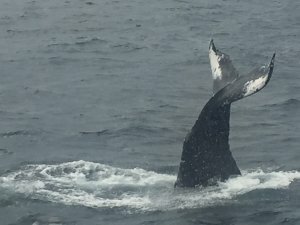 Provincetown is the best location on the East Coast for whale watching. Rare Right Whales congregate here in April and then Humpbacks, Fin and Minke Whales stay in our waters through October. The Dolphin Fleet offers numerous departures a day on their modern fleet of vessels. Each tour takes about three hours and has a naturalist aboard. Our favorite departures are the last of the day so you can enjoy sunset on the sea as your return. There are all sorts of water sports to enjoy. Kayaking, fishing, sailing, boating and even yoga on water boards! New for 2019 are guided bike tours provided by Pedal Ptown, offering 2 and 3 hour guided bike tours through Ptown and the National Seashore park. Our guests can use our complimentary bicycles for these tours. The town of Provincetown can keep the visitor busy for days. Commercial Street is the main thoroughfare and is clogged with throngs of pedestrians in peak season making it all but impossible to drive down the street. Perhaps the most fun is to grab a seat at one of the many sidewalk cafes and just watch the endlessly fascinating parade of strollers on the street. It is quite a show! Commercial Street is lined with a large number of unique and interesting shops for the visitor to explore. You won’t find chain stores here. Just unique boutiques for the home, clothing or that special gift. Provincetown is home to one of the oldest art colonies in America. Commercial Street is lined with various art galleries with the largest concentration of them in the East End. Friday night from about 7:00pm to 10:00pm in-season is the Friday Night Gallery Stroll when galleries have their openings, serve wine and showcase their most recent works. PAAM, the Provincetown Art Association Museum, is Provincetown’s fine arts museum and has an ever-changing and impressive showing. 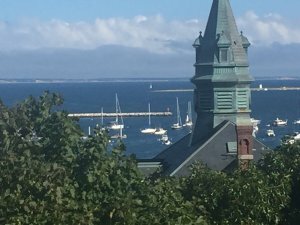 The tall structure you see dominating the Provincetown skyline is the Pilgrim Monument. This structure was built over 100 years ago to commemorate the Pilgrims landing in Provincetown harbor. Very few realize the Pilgrims spent their first days in America in Provincetown where they signed the Mayflower Compact before heading off the Plymouth. You can climb to the top of the Monument for spectacular views. On a clear day you can see all the way to Boston. There is also a quirky and fun historical museum at the base of the Monument. Rainy days offer a great excuse to explore nearby Truro and Wellfleet. Wellfleet is a charming town to explore with its fishing harbor, galleries and boutiques. Perhaps enjoy some of the local Wellfleet oysters. While Truro is rural and doesn’t have a town center, Truro Vineyards is a great place to stop in for a wine tasting. Neighboring Atlantic Spice is another great stop for home cooks as they have a large retail store with spices and kitchen supplies.